No matter what your aims, be it just to strum the chords to some of your favourite songs, learn to play stunning fingerpicking songs, get your grades, to be the fastest player in town, learn classic rock and blues or to aspire to play Wembley. With hard work and dedication, we will get there! Please note, slots are very limited so give Dan a text or call today on 07546 392 468 and together you will reach your guitar playing goals in a fun, simple and effective way. I have a passion for playing as well as teaching, and I want you to get the bug for playing if you haven`t already. My aim is for you to leave the lesson with a smile on your face, and an eagerness to get back. Just like I did, when starting out, I even ran home from one lesson so I could get my guitar out and get playing again. No matter what your aims, be it just to strum the chords to some of your favourite songs, to get your grades, to tear up the fret board and be the fastest player in town, or to be in a band and aspire to play Wembley. With hard work and dedication, we will get there! If you want to check out my playing, have a listen here. All the guitars on these tracks were written and played by myself. You are never too old to learn to play guitar, and as long as your child is committed and has the physical attributes to be able to do basic techniques (such as having the finger strength to push the strings down), they won`t be too young, As a broad guideline, age 8 upwards is probably the best age to learn guitar from. Some of my students have varied wildly in age; from youngsters picking up the instrument for the first time, to senior citizens learning their very first musical instrument – age really is just a number. These are the most fun, rewarding and cost effective way of learning the guitar. You`ll be paired up with another student of a similar ability and both taught by Dan at the same time. The two of you learning together will ensure that your progress is much faster and much more rewarding. You`ll gain a learning buddy and research shows having someone learn alongside you sky-rockets your success. Unlike large groups, you`ll also both have Dan`s undivided attention and you`ll only be paired with someone who wants to learn the same style as you. Best of all, using this method you will be able to start making real music right from the get go. Paired lessons are unique to Rockstar Guitar Tuition and exist to get you the best for your money. Costing just £19 per lesson you`ll save a lot of money and make faster progress. Contact Dan on 07546392468 today for more info. All ability levels welcome – from absolute beginners to advanced players. It doesn`t matter how long you have played for or how good you are right now, together we will make you the best guitarist possible. If you are an absolute beginner, you are in the right hands. Over the last few years, I have created a course aimed specifically at beginners. The `Beginners Course` is a 12 week lesson plan aimed at getting you playing songs with proper technique from the very first lesson. It`s up to you if you would like to enter this course. I am flexible when it comes to lessons, yet I have found students thoroughly enjoy this course as it systematically improves your playing while making your introduction to guitar a fun and exciting experience. We will get you learning simple melodies all the way through to some of the most popular songs of all time. You will be delighted with your progress. The course costs the same as normal lessons. If you would like to learn specific styles (Eg. Metal) or specific techniques (Eg. finger picking) we will make that our focus. Apart from the `Beginners Course` every lesson plan is unique for every student. We will learn what you want to learn, the styles you like, and the songs you love. If getting your grades is something that interests you, then we shall get there. I will teach you from preliminary to grade 8. The RGT framework is an excellent platform for expanding and improving upon all aspects of your guitar playing. Having a series of exams over the course of your guitar playing life is great for motivation, measuring your success, as well as gaining a sense of achievement when you reach the next level. From grade 6 onwards they even count as UCAS points. I thoroughly recommend it. Check out the RGT website for more info on grades. So, if all that sounds good for you and you live in Sandwell (Cradley Heath, Old Hill, Halesowen, Rowley Regis, Oldbury) Dudley, Birmingham or Stourbridge, you can text or call me on 07546 392 468 to book a lesson. 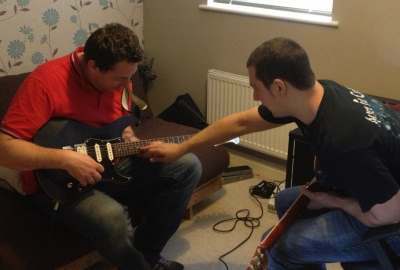 Click HERE to find out more about `Paired Guitar Lessons`. The more cost-effective, more fun and more productive way to learn guitar. Learn guitar in a super fun environment!